Sake Oyakodon (Salmon and Salmon Roe on top of rice). Oyako means 'parent and child' so salmon is the parent and salmon roe is the child. Normally Oyakodon without the word Sake (salmon) in front serves you chicken (parent) and egg (child) on top of rice. This is the Sake Oyakodon set - MYR30++ - with a starter, chawan mushi, miso soup and fruits apart from the main sake oyakodon. 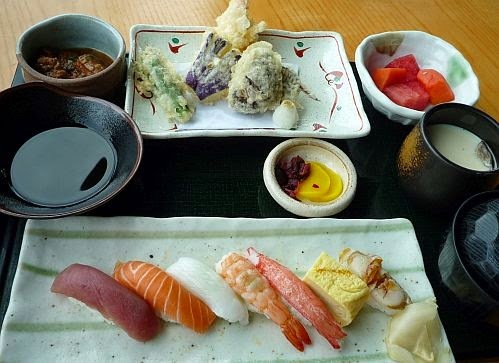 Sushi and Tempura set - MYR38 - with the same starter, chawan mushi, miso soup, pickled vegetable, in addition to the main tempura and sushi. 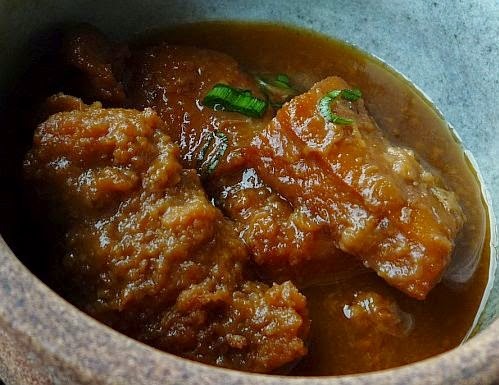 Close up of the starter-of-the-day - some sort of fried fish stewed in a sweet miso gravy. Strong flavour. Close up of the sushi served - tuna, salmon, squid, prawn, crab, tamago, scallop. The size of the sushi is rather small compared to those I ate in Tokyo but it is fresh and tastes naturally sweet so it is fine for me since I find the price reasonable too. Where else but at our favourite Japanese restaurant, Kura at One World Hotel. 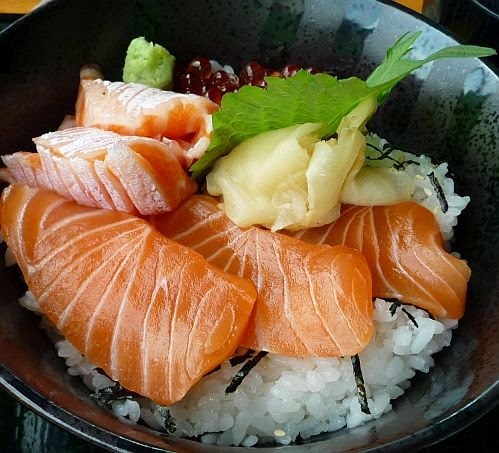 I would go for the sake oyakodon, look at the salmon chunks! Looks so big, fresh and juicy and yummy! I wish I can have 3 bowls of that! Leave your stomach space for other food. No need to eat 3 bowls of the same food. Looks great! Now you've got me craving for Japanese. My regular joint is having a promo on unagi - my girl loves that. May drop by for lunch after church today. Ah, can't wait to read your post on your unagi feast. I always wonder why they spell it sake. I think the correct spelling should be shake (pronounced as sha-ke), at least that's what I saw when in Tokyo. Still, my eyes is not playing tricks on me, is it? The pieces of salmon look rather thick, which is wonderful! Yes the pieces of salmon are thick. 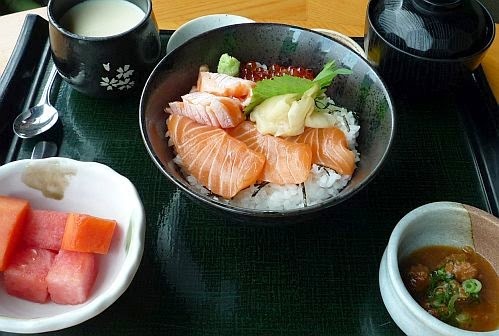 Sake and shake are both used to refer to salmon. There are many links on the internet discussing the difference between these 2 words. I want the sake oyakodon too. I love salmon and roe so this is for me. I will go for the fried fish stew, looks very yummy and cooked items...don't know how to enjoy raw stuffs. I must go to Kura again one of these days! The food there is very good. You always go one u so you can walk to kura. Crab parent and child with rice? Hehehe.. The prices are very reasonable for a Japanese restaurant in a hotel. i prefer the second set! coz i like tempura! Near your place, right? Worth it to go. Yes maam! We do go to 1u a lot, but this place is the hotel right? So never pass by lor. Yes this is the adjoining hotel. Yum yum yum! This is something I'll always order if I don't get unagi don. Very reasonable since there are many other food in the set.